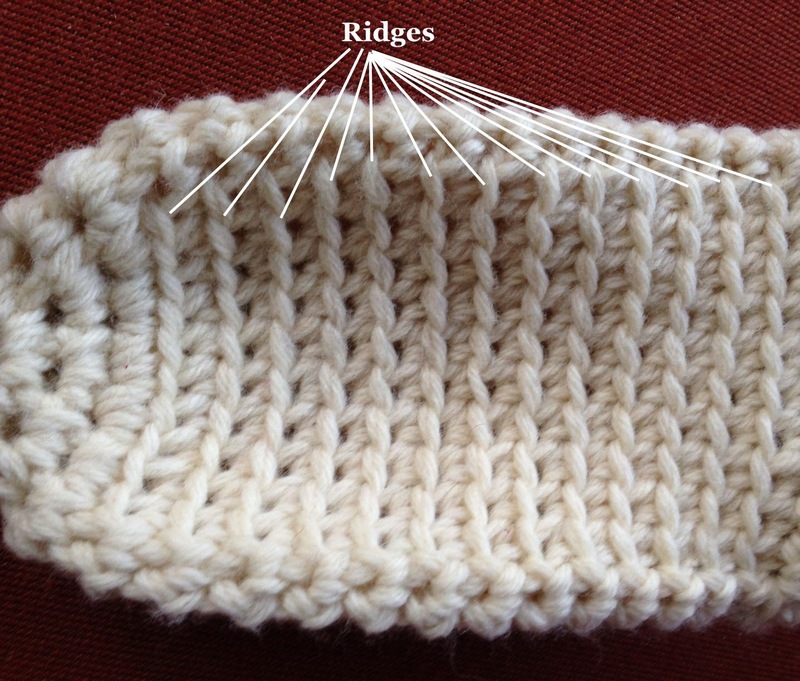 This pattern has been fully tested by a wonderful group of Ravelry testers. Working a sequence of front loop only and back loop only makes for a unique shaping. Yarn held double, large hook size and SC's throughout, this works up SUPER fast! These are soft and squooshy and would make a wonderful gift. Very easy, I would call this a easy-intermediate pattern. To Download, View, or Print this pattern please scroll all the way down past the pictures and click on the link. 3 sc per inch & 3.5 rows per inch in sc. Using Magic ring, sc 7(,7,8,8) in ring, join with slst. *Now you will work in rounds, no need to join with slst just go right to next stitch in round. 3. 10(10,11,12) sctfl, 2 sctbl, 2 sctfl, 10(10,11,12) sctbl, 2 sctfl, 2 sctbl. 4. Rep step 3 for 12(13,14,14) more rounds. You should have 13(14,15,15) ridges on bottom of foot. (do not count the last row you worked, just the visible ridges in previous rows. At this point you should try it on, the ridges are at the bottom of the foot. Your slipper foot should be of length to fit about like this (pictures below) and should be about 1" (ish) from the crook of your foot/ankle. *You can always add one more row or pull out one more row to get the right foot length, just make sure to count your ridges to make the second one the same way. Now you will turn and work on the heel, on just 18(18,19,20) sts. (you are no longer working in the round). Normally you ch1 and turn but for these slippers you do NOT ch1 when you turn. Simply turn, making sure you do not skip the first sc. 6. Rep last row 6x(6x,6x,7x) more. 8. Size Sm & Med ONLY: 5(5,-,-) sc, sc2tog 3x, 5(5,-,-) scs. 9. 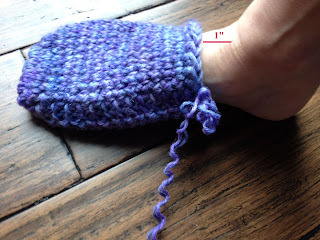 Pull up your last loop slightly, just so it doesn't come undone, pull out the hook, fold heel in half as shown in picture, insert hook from the opposite side of the last stitch worked. Grab loop and pull it through the opposite side, ch1. Please note that there will be a gap/hole created where the two sides of the heel come together - this is correct, you will stitch that closed later. Now you will work in the round again making the cuff of the slipper. 12. 8(8,8,9) sctbl, sc2togtbl, 8(8,9,10) sctbl, sc2togtbl, 8(8,8,9) sctbl, join with a slst into top of first sc. Turn slipper inside out to stitch the open gap. 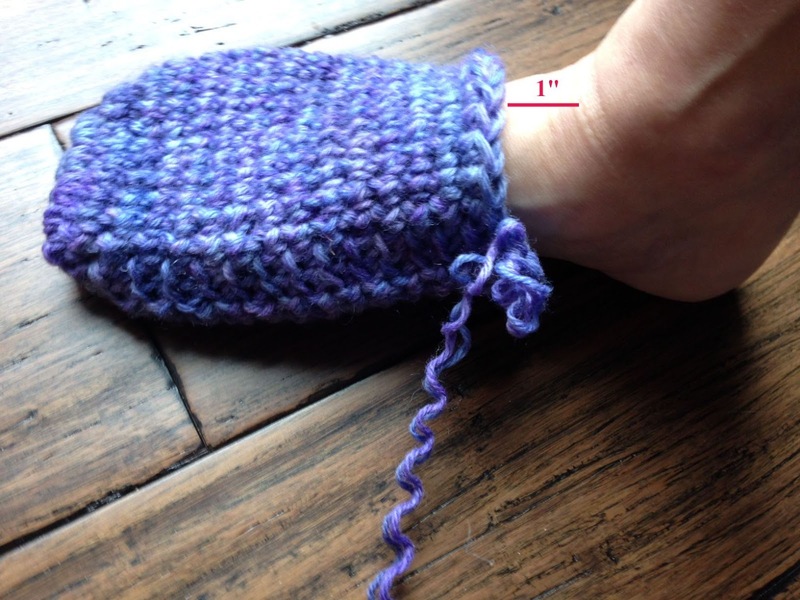 Use a darning needle and a tail of yarn. Also make sure you secure the tail from the original magic ring so that it does not come undone. This is absolutely brilliant! Thank you very much for a smart design and easy instructions! I just finished my first pair! Great pattern. Very easy to follow and easy to customize. I made a few modifications for a more personalized fit and for personal comfort. I added two rounds to the mid-foot to make the slipper longer, added two rows to the heel before the decrease rows, eliminated the decreases for the cuff, and only did two rounds of sctbl for the cuff. I used one strand of acrylic and one strand of a washable wool blend yarn. Makes for a nice, cushy slipper that is warm and cozy on the foot! Will make again and will make several for gifts! This has to be the best crocheted slipper pattern I've seen. You have combined the best of all the others with your own unique ideas and added the easiest illustrated instructions. I will enjoy this for years to come as will crocheting friends. Thank you! Finally a unique, stylish slipper pattern. Great directions and visuals. This is great--I've made it as a cast cover for my broken foot in the winter weather! Just went with the XL and added 2 extra rows to the heel, and I might keep going with a long cuff up to the knee. It's a life-saver, and so warm! I have to agree with everyone else, these are fantastic! Not sure why I'm not seeing this pattern on my news feed because I've never seen such wonderful crochet slippers. Directions are so precise I had no problems and the fit is wonderful. Thank you! 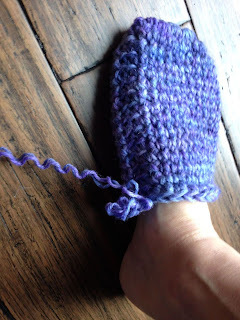 I've been searching for a quickly worked, attractive slipper pattern for guests & to give as gifts. I enjoyed this pattern & will be keeping many feet warm this winter. I may add a 2nd color around the cuff, for a little personalization. I, too, increased rows to get the ideal fit. I really appreciated the periodic photos to compare my work to! Great pattern! Can this item be made to sell or not? Thanks!